That's the number of bulls left in the USD. As we've learnt throughout history, when the sentiment reaches an extreme then it's likely that the market is about to do that, what nobody is expecting. Hence, when everybody is expecting a collapse of the Dollar, then we should look for a bottom. 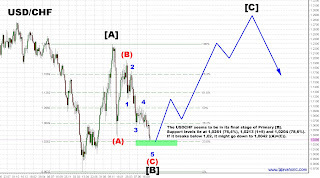 The wave structure (shown for the USD/CHF) favors this scenario as well. It should be in the last wave of Primary [B]. Some fibonacci relationships are at 1,02ish, thus I expect the bottom to take place in this area. After that we should see a nice rally possibly up to 1,30 over the next few months/years.